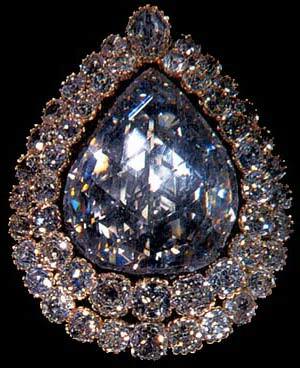 The pride of the Topkapi Palace Museum and its most valuable single exhibit is the 86-carat pear-shaped Spoonmaker Diamond, also known as the Kasikci. 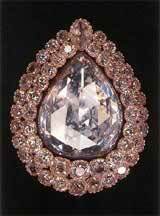 Surrounded by a double-row of 49 Old Mine cut diamonds and well spotlighted, it hangs in a glass case on the wall of one of the rooms of the Treasury. "In the year 1669, a very poor man found a pretty stone in the rubbish heap of Egrikapi in Istanbul. He bartered it to a spoonmaker for three wooden spoons. The spoonmaker sold the stone to a jeweler for ten silver coins. "The jeweler consulted another jeweler who knew immediately that the pretty stone was really a precious diamond. When the second jeweler threatened to disclose the whole matter, the two men quarreled bitterly. Another jeweler heard the story and bought the diamond, giving a purse full of money to each of the angry jewelers. But now the Grand Vizier, Kopruluzade Ahmed Pasha, has heard of the gem. When Sultan Mehmed IV is told of the affair, he orders the stone be brought to the palace, and he takes possession of it. Whether he paid for it is not revealed. And, of course, no one knows what history preceded it being thrown into the garbage heap." A more probable story is that in 1774 a French officer named Pikot bought the diamond from the Maharajah of Madras in India and then took it to France. Somehow thieves got wind of the gem and robbed Pikot. Sometime later a large diamond about the size of the stone taken from Pikot, appeared at an auction, and the notorious Casanova made a bid for it. The diamond thus became known for a time as the Casanova Lottery Diamond. It was finally bought by Napoleon's mother, Letizia Ramolino, who later sold her jewels to help her son escape from Elba in 1815. An officer of Tepedelenli Ali Pasha bought the great diamond for 150,000 pieces of gold and put it in Tepedelenli's Treasury. When he was killed in the revolt against Sultan Mahmut II, his entire treasury came to the Palace of Turkey. It is probable that the stone now called the Kasicki, is the long lost Pikot (aka Spoonmaker's) Diamond. Source: "Diamonds Eternal" by Victor Argenzio. Printed by the David McKay Company Inc., New York. 1974.